Four rooms seating from eight to eighty-five are available for hire. Their individual character and varying sizes accommodate a wide range of events, from meetings, conferences and training courses to concerts, corporate entertaining, Christmas lunches, wedding receptions and other social functions. We are licensed for civil weddings. All the rooms have an airy feel, with plenty of natural light. Audio-visual equipment is available, and your room will be set out to your requirements. 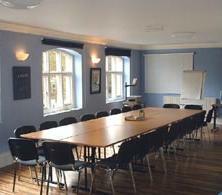 Wireless broadband internet access is available in all meeting rooms for a small charge. Discounts from the prices shown may be offered to registered charities, for arts and music education and to certain non-profit groups, at the discretion of the King of Hearts.